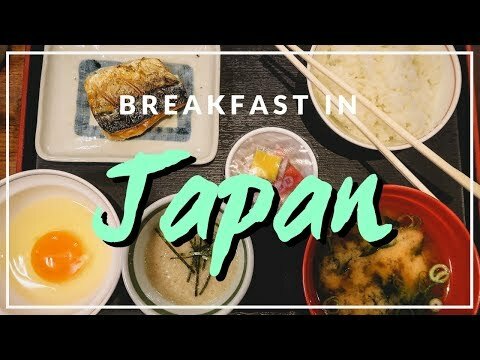 Join us as try eating traditional Japanese Breakfast in Osaka, Japan at a 24 hour restaurant we found near the apartment we were staying at in Osaka, Japan. Given our struggles with jet lag we had already been up for several hours when we ventured off to grab some breakfast in Osaka. It was so early the metro stations had not even opened and we had more of a hangover crowd rather than businessmen and women heading off to work. We noticed this little 24 hour restaurant nearby Nagahoribashi Station, next door to Yoshinoya. Sorry, we forget the name of this place and it isn’t on Google maps but if you find the Yoshinoya just outside of this station you’ll see the restaurant just to the right of it. In terms of the traditional Japanese breakfast we ended up eating a lot of standard items such as rice, fish, tofu, miso soup, ginger, Nattō, tea and other things. It felt like a very healthy way to start the day with decent amount of protein, functional carbs and nothing to sugary. In fact it was more of a salty and savoury breakfast which we enjoyed because we didn’t have a sugar crash afterwards. Have you had breakfast in Japan before? What did you try? If you are Japanese or a foreigner based in Japan do you feel this is a typical Japanese breakfast or did we miss out on some dishes? What do you typically have for breakfast at home wherever you are watching this video from? Please let us know in the comment section below. Good morning guys. It is another early start for this jet lagged duo. It is right now it is 4:52 in the morning and we’ve already been up for what an hour and a half? Since 2:30. We figured since we are up early let’s go have some breakfast but not any breakfast. This is going to be a traditional Japanese breakfast. We noticed a place when we were up jet lagged the previous morning it was open 24 hours. It is a chain restaurant and we’re going to go there and grab some traditional Japanese breakfast. Let’s go eat. We just finished placing our order. We got a little ticket from the machine. And then we handed it the ticket to the server. She ripped it in half. We get to keep this. Breakfast is here. For Japanese breakfast we did a little bit of research. To see what the typical dishes are. And it usually includes steamed rice. Miso soup. A protein like grilled fish. We’ve got some tofu going on. We’ve got a raw egg. This looks like some kind of porridge. Um it says nori. So a dry seasoned seaweed. I’m seeing a little bit of that sprinkled on this thing. There are some additional side dishes we might order too. I mean you can always go to the machine and order some individual little dishes. Yeah. If you want more rice or if you want more egg. It also says Nattō fermented soy beans. And I did notice that on the menu. We just didn’t get the meal that comes with the soy beans. I’ll probably I’ll see if I can order that later. Fermented soy beans? I think we got the main items of a Japanese breakfast. In total came to 490 and 590 Yen. Yeah. Which in total was $9.80 USD. Incredible value. It was a complete breakfast. I really liked having protein and some healthy carbs with the rice and just there is a lot of variety and it was thoughtfully prepared too. I hope you guys enjoyed taking a look at this traditional Japanese breakfast and we’ll have more food and travel videos for you coming soon from Japan.